A loaded women’s distance field and a dynamite sprinting duo will be on display in Albuquerque at the Mountain West Conference Indoor Championships. This one is shaping up to be a dual meet between New Mexico and Boise State--two of the country’s strongest women’s distance programs. With the big names (Kelati, Ostrander, Kurgat), already secured a place in the NCAA Championships, this race is about trying to get their teammates qualified with a top 16 mark (right now that time is 9:07.07). And there are a whole bunch on the bubble. For New Mexico, Hannah Nuttall sits 18th on the descending order list, while Adva Cohen is 20th. Charlotte Prouse hasn’t run a 3000m this year, but has the ability to run under 9:07. Boise State’s Emily Venters is 22nd in the country and Clare O’Brien is 31st. Keep an eye on the clock and have your altitude conversions handy. Boise State already has a place in the NCAA meet from their performance in Seattle earlier this month. New Mexico doesn’t have a time yet this season, but certainly has the personnel to pull it off. With Kurgat and Kelati not needing to worry about qualifying in individual events they can devote a good portion of their mental and physical energy to this race. Boise State will provide ample competition so expect this one to be quick. MaryBeth Sant of Colorado State and Destiny Smith-Barnett sit fifth and sixth on the descending order list entering this weekend. Sant ran 7.18 (converted to 7.20) in Boulder, while Smith-Barnett ran 7.17 in Flagstaff (converted to 7.21). 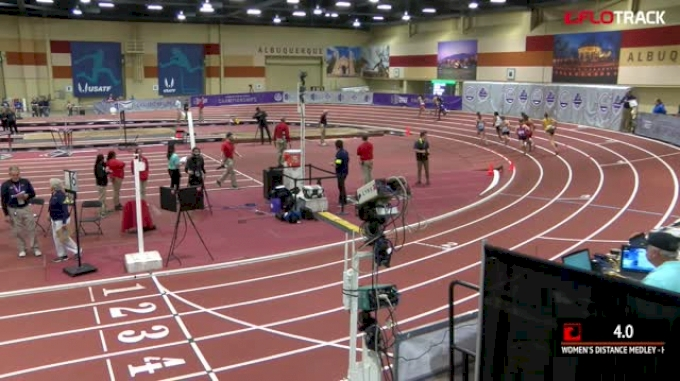 Altitude conversions and national qualifying aside, this race looks destined to be very close in Albuquerque. Sant has more separation in the 200m. Her season best of 23.45 has her outside the top 16, but still ahead of Smith-Barnett’s 23.81. The fun will be in sorting out the logjammed men’s field. Four of the entrants have converted season bests that are within 1.19 seconds of each other. Cole Rockhold of Colorado State is the most accomplished of the group after winning the 5000m at the conference meet outdoors. He’s only run one race this indoor season--a 4:06.39 mile at the Husky Classic. His teammate, freshman Michael Mooney, has the top season best of the group. He ran a converted 4:05.20 at the Colorado Invitational. Add in Michael Downey of Wyoming (4:05.71) and Jonny Glen of New Mexico (4:05.80) and this should be a crowded final lap. The women’s 800m has been a bit of an enigma this winter. The pre-season favorites haven’t run any blistering times (and one went pro) and the race for the national champion has no clear favorites. Boise State’s Kristie Schoffield ran 2:04.34 at last weekend’s meet in Seattle, good for sixth best in the country. That means the sophomore will be in the role of favorite at these championships. Her best competition should from Avi’Tal Wilson-Perteete of UNLV--one of those pre-season runners who hasn’t yet run a big mark. Her best time of the season is 2:09:21, but she ran 2:01.14 last outdoor season.